HOME - AYA Builders - Alec Young Associates Ltd.
AYA Builders-Alec Young Associate LTD. Is locally owned and operated, with over 33 years of experience in the Whiteshell and lake of the woods areas. We offer admirable workmanship along with our competitive pricing. We work with many local businesses and our local designer to help you create your very own perfect lakeside destination. As General Contactors we employ our carpenters, plumbers, and electricians, this way you only need to consult with your Project Manager. Our job is to make the building experience exciting and hassle free. Our Project Managers work closely with you to ensure quality decision making from the blue prints to the paint colors. 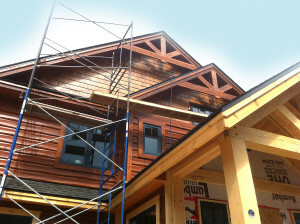 AYA Builders specializes in drilling in the Whiteshell/lake of the woods areas. We have over 17 years of experience drilling on the Canadian Shield’s rocky terrain. AYA Builders also specializes in the leveling of cottages and boat houses. We are properly equipped and have years of experience to safely execute any leveling job. © Alec Young Associates Ltd. All rights reserved.